The annual study - the largest of its kind in Europe - covers 48 countries and explores trends like fake news, communications’ contributions to organisational success, as well as the work environment for communication professionals in Europe. 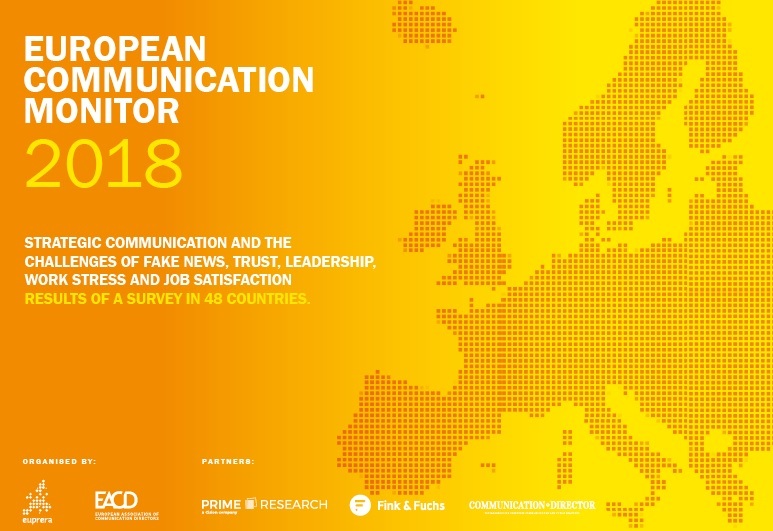 Based on responses from almost 3,100 senior professionals from 48 European countries, this years’ edition of the European Communication Monitor (#ECM18) reveals that despite the persisting debate about fake news across Europe (agreed upon by 55.8% of the respondents), this does not filter into the day to day experiences of communication practitioners (24.4%). The most affected by fake news are government-owned, public sector and political organisations (44.6% have been affected at least once in 2017/2018). Professionals based in Russia report the strongest impact of fake news on their organisations (53.2%), followed by Serbia, Slovenia and Poland (all more than 40%). The sources of fake news follow the origins of the debate with social media being the main source of misleading content (81.3%), but mass media (59.6%) can also originate this form of information. Most communication departments and agencies are not sufficiently prepared to identify fake news: Only 12 per cent of affected organisations have established advanced routines. Besides key trends like fake news, the survey explores communications’ contributions to organisational success as well as the work environment for communication professionals in Europe. Work engagement and stress, job satisfaction and its drivers as well as the status of leadership in communication units are explored with additional detailed analyses for 22 countries. Even though the information provision to decision-makers through different kinds of monitoring, surveys or news briefings is a common practice for most communication units across Europe (89.1%), only 28.4 per cent of the communication departments and agencies in Europe prepare advanced types of reporting with edited or curated content that delivers deep insights for decision-makers on a daily basis. Communication professionals are often expected to be high performers in a hard-working culture. No wonder that four out of ten communication professionals (39.0%) in Europe feel tense or stressed out during their working day. At the same time 25.0 per cent do not have the appropriate resources to manage this experience. Overall, 27.9 per cent has serious stress problems (reporting stress and not being able to manage it). Longitudinal comparison with the monitor surveys in 2010 and 2014 reveals a slow decline in overall job satisfaction among communication professionals in Europe. 28.9% of the surveyed practitioners would like to change their current employer within the next twelve months. However, three quarters of the communication professionals in Europe are happy in their job – overall satisfaction is the strongest in consultants or agencies (79.0%). The results have been released on 13 June in Berlin by the European Public Relations Education and Research Association (EUPRERA) and the European Association of Directors (EACD), supported by premium partner PRIME Research, a member of the Cision Group, digital communications partner Fink & Fuchs, and media partner Communication Director magazine. The communication monitor series is known as the most comprehensive research in the field worldwide covering more than 80 countries – the European survey is complemented by bi-annual surveys in other regions like Asia-Pacific, Latin and North America. >> ECM 2018 PDF Report (146 pp. ): Download and print the full set of charts. >> ECM 2018 Slideshare Report (146 pp. ): Browse the charts online.